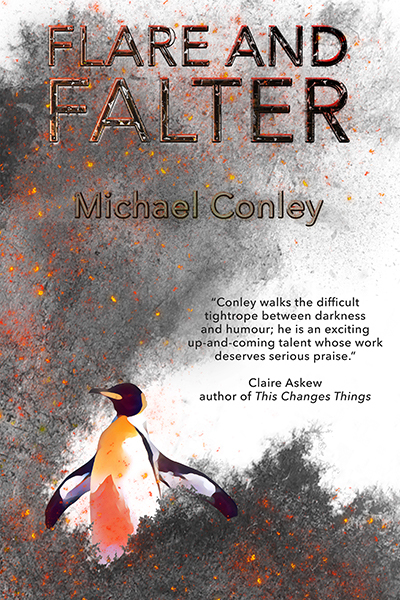 Michael Conley’s début work of prose, Flare and Falter, is a collection of stories with an unusual genesis. Michael was already an established poet by the time one of his stories was shortlisted for the Manchester Writing Competition in 2016. The story seemed like a good fit for Splice, so we got in touch last year and learned that Michael had already started putting together a volume of fiction. The end result is a mixture of stories from the initial manuscript, stories written after he’d sent the book out for feedback, and stories written in a frenzy of back-and-forth messages and a burst of creativity over the first half of 2018. Michael’s reputation as a poet is well-deserved. His work has appeared in various literary magazines and has been Highly Commended in the Forward Prize. He has published two pamphlets: Aquarium (2014), with Flarestack Poets, and More Weight (2017), with Eyewear. 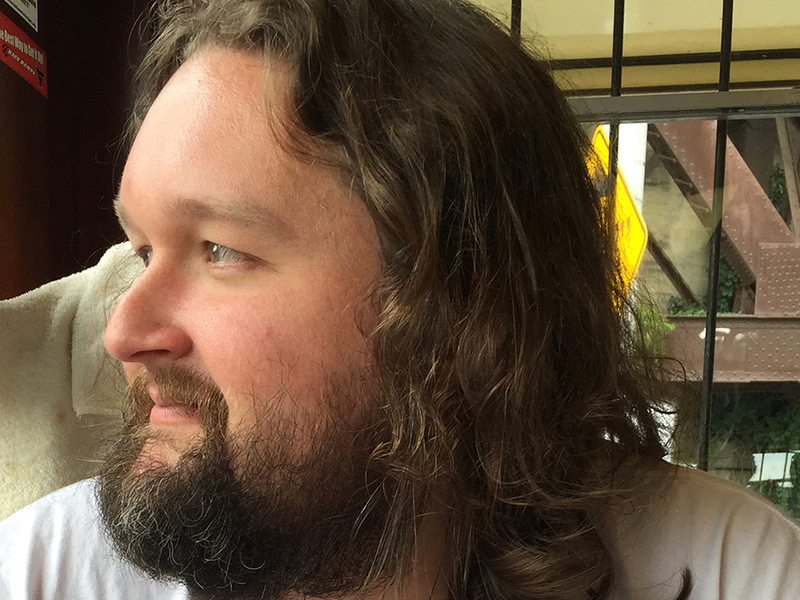 In this two-part interview, Daniel Davis Wood speaks to Michael first about his writing process and his movement from poetry to prose, and then about the nitty-gritty of piecing together Flare and Falter. So you’re officially a poet who has made the transition into prose, although you’ve been working on prose for a few years now. What was it that prompted you to try your hand at prose? And in general — thinking back to very early stories like ‘Anatidaephobia’ and ‘The God Quetzalcoatl’ — what particular rewards and challenges have you found in the process? Both of those early stories you mention, along with the vast majority of the shorter stories in the collection, actually started out as poems that I couldn’t make work. I originally had ‘Anatidaephobia’ written out in four-line stanzas, each of which had two short first lines followed by two much longer lines, which was supposed to resemble a side-on duck’s head, because I was amused by that idea as a stupid visual joke in a poem about a man haunted by a duck. But then the long lines got so long that they collapsed, and it basically turned itself into a piece of flash fiction. With ‘The God Quetzalcoatl’, that one started as a series of about seven or eight poems that I wrote, all snapshots of Quetzalcoatl’s life in the pub. I had them for a long time because I liked the idea, but I ended up having to be honest with myself that none of them were very good as poems individually. They didn’t quite have the intensity to stand by themselves. So the transition to prose in that instance, I guess, was just a case of stitching the moments in the poems together like a kind of patchwork. What about the more recent stories? Since January, when we started talking about publishing this book, I’ve worked very hard and intensively and probably been writing much more regularly and voluminously than I’ve ever done before. I’ve felt it’s been kind of a crash course. With prose I’ve enjoyed having much more breathing space structurally: ideas can be developed more slowly, and it’s been freeing to be able to disregard things like rhythms, line breaks, stanza breaks. But the other side of the coin is that, if you’re not careful, a lack of formal restrictions can make you less creative with language. Plus, you’re shaping something much bigger, and you can lose control of it more easily, and you have things like pace and dialogue to consider instead. Having said that, it’s important not to overstate the differences between approaches either. It’s still just putting the right words in the right order, in the end. That’s interesting to me for a couple of reasons. The first reason is that you did an MA at the Manchester Writing School, a pretty illustrious programme at Manchester Metropolitan University, so I guessed you’d at least dabbled in prose while you were there. Was that not the case? What kind of stuff did they have you doing? I did do a little bit of prose writing while I was there, but at MMU there’s a poetry route and a prose route, and they tend to keep them pretty separate. I did one elective on Crime Fiction, which I enjoyed because it taught me a lot about plotting and genre writing. But that’s what I saw it as — an exercise in learning some things about how to write that way — and the prose I actually wrote at the time probably wasn’t good enough to do anything with. And anyway, I was just more interested in learning about poetry and writing it, at that time. So how did the instruction you received at MMU actually end up shaping your work? I just saw the whole process as a huge privilege. I’m aware of how lucky I was to be in a position to do it, for a start; I’m a teacher and I did it part-time. Some of my favourite moments just involved being in a room with a handful of other people who loved literature and valued writing as much as I did. From conversations I had with those people, both in and out of the seminar room, I learned a lot about writers I’d never heard of — some of whom are now favourites — and about the wider UK literature scene, and where to send work off for publication. I remember I started the course thinking I was well-read, and then speaking to others and realising very quickly, with panic, that I wasn’t. So the first thing I learned was to read way more and engage more with current writing. All writing is part of a wider cultural conversation, so you have to hear what others are saying before you can contribute anything of real value. What about the workshop process, group critiques, that sort of thing? Useful or not? I enjoyed it. It helped me to see my writing as a piece of work I’d done that I could let go of, rather than a little piece of my soul that I had to guard from criticism. It taught me that producing ‘bad’ writing does not automatically make you a fool or a bad writer, and that doing so is not only inevitable, but maybe even a necessary part of the process of producing ‘good’ writing. But the best things I learned from doing the MA were all personal and developmental, rather than specific instructions or writing techniques or anything like that. Actually, that ties into the other thing that I find interesting about what you said regarding your work in prose. If I can put it this way, your stories seem to be liberated from received ideas about what constitutes ‘good writing’ and ‘bad writing’. It’s not like the language is ever sloppy or that the structure is loose — far from it — but that they have this quality of wild abandon to them, like a flagrant and conscious disregard for conventional notions of neatness. I do like Donald Barthelme a lot, and I like your phrase “a flagrant and conscious disregard for conventional notions of neatness.” Anyone who’s seen me try to wear a suit for a wedding will recognise that. I take your comments here about wild abandon as a huge compliment. It’s a quality I’m always excited to find as a reader: my favourite writers are ones who do unpredictable and even confusing things. I guess what I mean is that there’s no sense, ever, that you’re working with some of the narrative and stylistic templates you tend to find in creative writing classes. Every story is its own particular beast, and it feels like it has come into the world with no anxieties about how its shape matches up with other stories. How much of this feeling is something you’re deliberately aiming to create, and how much is more the product of spontaneity and speed? Going into a new story, on the first draft, do you give a lot of thought to the ways in which you can make it different to everything else, or is this something that happens along the way? The two best books I’ve read in the last year or so have been George Saunders’ Lincoln In the Bardo (2017) and Leone Ross’ Come Let Us Sing Anyway (2017), both of which I loved because they took you with them, but never made you feel entirely comfortable from one page to the next. I read Ross’ book especially at a time when I was working on a lot of the stories in this collection, and it was like a shot of creative energy: “Oh, stories can twist this way, or can be doubly effective by being doubly shorter, or can end abruptly like this.” Eley Williams’ Attrib. (2017) did a similar thing. On the other hand, with some of the stories, I used poems as touchstones: for example, ‘All the Little Yous Just Find Each Other’ came from a line in a James Wright poem about bursting into blossom, and ‘Pinniped’ was inspired by Elizabeth Bishop’s ‘At the Fishhouses’, in which Bishop describes the taste of the sea as like “what we imagine knowledge to be”. I had both of those poems in front of me almost the whole time I was writing those stories, as inspiration. So I suppose that doing unusual things with stories isn’t something that I set out to do deliberately when I start, because it’s the ideas that come first. But it’s certainly an effect I want, so I don’t think it’s entirely due to spontaneity either. I wonder if it’s also something to do with not deciding straightaway whether what I’m writing is a poem or a piece of flash fiction or a longer short story. I feel like that approach maybe opens up some avenues structurally, or in terms of perspective, which might otherwise be closed off too early. One particular thing I’d say is that you’re very, very good at working in two quite different modes of writing, and sometimes reconciling them. You’re great at intermittent structure, using section breaks to make a narrative jump ahead in time — a day, or several days, or weeks — and then just slyly indicating some of the incredible things that have happened in the interim. And you’re great at orchestrating an ‘us versus them’ dramatic conflict that builds tension through events on the periphery of the action: rumours and hearsay, heckling, naysaying, all of which erupts into something more serious. I don’t know whether you find it easy to write in these two modes, or easier than writing in a more conventional mode, but most writers I know find this stuff hard. It’s hard to maintain the momentum of a narrative when you keep chopping up its structure. It’s equally hard to maintain the tone of a conflict when you don’t focus on the participants and really take time out to develop their psychologies. And yet, you make it look like a breeze. If you’ll allow me to get technical, I’d say that you maintain the momentum and the tone not by amping things up with the structure or the conflict, but by throwing in oddball details at regular intervals. The reader is urged to read on, I think, not because he/she is wondering what will happen next, but because he/she doesn’t know what’s coming next at the level of the sentence and in the imagery. Yes, what you’re saying about the power of oddball details and sentence-level surprises is exactly what I aim for every time I write something. It’s interesting that you say other writers sometimes find it hard to structure stories like this. For me, maybe because I’m used to writing these weird little semi-narrative poems, it feels easier, yes. As I said, I think my two touchstones at the moment are George Saunders and Leone Ross; Ross’ book really inspired me, and I think Saunders is the master of the oddball detail, which is why I find it exhilarating to read his sentences. Plus poets like Thomas Lux and Selima Hill do that too, and they’ve always been big influences. It’s a line from ‘The Armadillo’ by Elizabeth Bishop. She’s probably my favourite writer. I wanted to keep the title loosely linked to ideas around entropy, which you mentioned during the editing process, foregrounding entropy as a thematic link between the stories. This one stood out for me one afternoon as I was looking through Bishop’s Collected Poems. Yeah. It was so unexpected, or it came from such an unexpected source, and yet, as soon as you put it out there, it felt right. Poetic inspirations aside, what about your political inspirations? Or, more accurately, your literary political inspirations? A lot of your stories are very political — not in a Jonathan Coe state-of-the-nation satire kind of way, but more in a Dario Fo angry rhetorical farce kind of way. I’m wondering who you might take your cues from in that regard? In literary terms, less Coe, more Fo, correct. Perhaps somebody in the middle of those two is Terry Pratchett, whose Discworld novels had a huge impact on me as a child. I read them all from the ages of about eleven to eighteen. There’s definitely anger in them, but that anger bubbles away beneath the surface. I think I also picked up from Pratchett that, if the human condition can be boiled down to anything, it’s probably incompetence. At the same time, though, acknowledging this shouldn’t involve a turn towards empty mockery or nihilism. The anger should stem from frustration or disappointment, but never hatred. There’s a fine line there. I like political writers who highlight absurdity but also angrily uphold the almost unreasonable expectation that we can all do better. After Pratchett, as I got older, I discovered Vonnegut doing something similar, and also Margaret Atwood. They’re writers who play the important role of the child at the end of ‘The Emperor’s New Clothes’ going: “Everyone just hang on a minute…” I suppose the problem now is we’re seeing emperors who can manage to make a virtue of their nakedness and then convince just enough people that the child is a sneering elitist. So what do political writers do post-Trump? I guess we’ll find out, won’t we? Sure, assuming there’s such a thing as a post-Trump era. We might not make it out. One more topic to ask you about, before we talk about the collection itself. You submitted some of the stories in Flare and Falter to competitions like the Bridport Prize and the Manchester Prize, and you had some success. How do you think this affected your development as a prose writer? Were you surprised that your prose could catch judges’ attention? Did you ever receive any real feedback from the places you submitted to? I’ve received general feedback from judges’ reports, and the Manchester Fiction Prize was nice because there was a ceremony and a meal afterwards, so I got some feedback verbally. But — and this is the teacher in me coming out now — most feedback is, by nature, summative, not formative. It’s “I’m the judge and this is what I liked about what you did” rather than “this is a working document and here’s what you could do better”. So, in that sense, it isn’t directly affecting my development. That’s probably as it should be, too: it’s probably not good, when writing, to be too concerned with doing the sorts of things that will grab competition judges’ attention, at the expense of serving the ideas as they come. This is part one of a two-part interview with Michael Conley. In the second part, Michael discusses the process of writing his short story collection Flare and Falter. 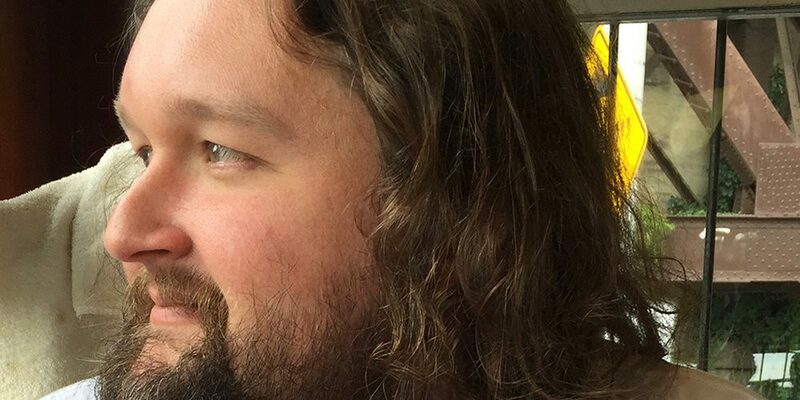 Michael Conley is a writer from Manchester and the author of Flare and Falter. His poetry has appeared in various literary magazines, and has been Highly Commended in the Forward Prize. He has published two pamphlets: Aquarium, with Flarestack Poets, and More Weight, with Eyewear. His prose work has taken third place in the Bridport Prize and was shortlisted for the Manchester Fiction Prize. He tweets @mickconley.